Taking a break during one of the last training runs before the big race. Iditarod – here we come! SP Kennel sled dogs and mushers are almost to the starting line. The week prior to the big event is probably my most stressful. If you are an organized person, like me, then you like to have everything ready for your race. I try to categorize my week in four parts in order to make it manageable. Of course, number one is always the dogs. Iditarod requires that all potential race dogs have blood drawn and ECGs. These tests will be analyzed by doctors in Anchorage prior to the race. The head Iditarod Vet, Dr Stu Nelson, will call us if he sees any anomalies with our dogs’ health. As well, we are required to worm all the dogs before they take to the trails that go in and out of many Alaskan villages. It is a safety precaution for the dogs and the people. Then of course there are a thousand “other things” to check before the race: toenails, ears, eyes and attitude. As a dog owner – I should be well aware of any issues with my dogs – but just in case I miss something – we have our Vet, Dr Rouge – come out to the kennel and give each dog a full health check one week before race start. Number two is gear. There is so much that I carry with me for 1,000 miles of wilderness travel by dog team. Hopefully, it is not a lot of weight, but is a well thought out, packed sled with anything and everything I might need. I like to check all this gear before I get on the trail making sure that I have enough of certain things and that they aren’t worn out or old. Checking harnesses, lines, snow hooks and the sled is just the start. I sort through my med kit, thermos, straw bag, sleeping bag, extra clothing, mitts, tool kit… the list is endless. Final training runs is number three. As I prepare for the Iditarod, I can’t forget that the athletes – all of us – still need to stretch out, run and train like we have a 1,000 mile race ahead of us. It is easy to get caught up in the race hype as well as the last minute preparations but it is best to stay consistent with training. The dogs should stay on a regular run schedule, with a small taper near the end. And my work out schedule stays the same until the bitter end as well. Lastly, we need to get to the starting line. This is a biggie. For us mushers, dogs, sleds and gear will be driven about 400 miles to Anchorage for the Iditarod start. Dog trucks are notorious for not functioning correctly when you need them to, sleds fall out of trailer and dogs get left at the kennel! Loading and unloading dogs into their travel boxes needs to be done with extreme care – we do not need any pinched toenails or toes. Drive cautiously and take your time – you are not racing… yet! For Iditarod, as well as the Yukon Quest, there are festivities and meetings several days before the start. Make sure the dogs get stretch out time and proper feeding while the mushers attend ‘Meet & Greet’s” and banquet. This is what my last week looks like, but after that …. Iditarod here I come. 3 – 2 – 1 GO! There is not much we need to say to introduce this four-time Iditarod Champion. Howling Dog Alaska has been one of Jeff’s main sponsors for many years now. And here we are, with yet another season ahead of us! Jeff King is often recognized as the “Winningest Musher in the World.” He holds four championship titles for the 1,049-mile Iditarod Trail Sled Dog Race in 1993, 1996, 1998, and 2006. Jeff took first place in the 1,000-mile Yukon Quest in 1989 in addition to earning twenty-four other first-place titles in races across Alaska and other parts of North America. Jeff was inducted into the Iditarod Hall of Fame in 1999 and the Alaska Sports Hall of Fame in 2017. In 2006, at age 50, he became the oldest musher to win the Iditarod. Jeff King has twice received the prestigious Leonhard Seppala Humanitarian Award for exemplary care of his dog team. He has logged more than 150,000 miles on a dogsled over the past thirty-five years. Jeff enjoys living just outside of Alaska’s Denali National Park and sharing his life with his sled dogs. He is well known for several inventions in the dog mushing equipment field. In the summer months, his kennel Husky Homestead welcomes visitors from around the world to watch his sled dogs in action, hear stories of adventure, learn about Alaskan Huskies, the tradition of dog mushing and the life and spirit of Alaska, the last frontier. A natural-born storyteller, Jeff shares a lifetime of adventure stories in public speaking engagements and in his book Cold Hands Warm Heart. Visit Jeff’s Husky Homestead website. Jeff’s harness of choice is our Hybrid Light Weight Harness and our Distance Harness. Howling Dog Alaska is very proud to have this famous wife & husband duo, known not only for their outstanding race performance but also for dog care that is second to none, on board again this season. Aliy Zirkle and Allen Moore own and operate SP Kennel – a premier Alaskan Husky sled dog kennel in Two Rivers, Alaska. They are dedicated to their individual dogs through excellent health, nutrition, training, and care. Aliy and Allen are both Yukon Quest Champions. Allen has won the Copper Basin 300 six times and Aliy has placed in the top five in the Iditarod for the last few years (placing second three consecutive years: 2012, 2013 and 2014). The future of SP Kennel is evolving. This mushing season, Aliy and Allen will be racing less. The goal in doing this is that they can focus more on individual performances. They will rarely have two teams entered in an event. As you all know, in the past, they raced many events with many dogs and many teams – for instance, it was common for them to have three teams in the Copper Basin 300. However, now their goal for fewer SP Kennel teams to compete and thus, fewer logistics, less preparation, less chaos, and less individual stress and more FOCUS. Their goal this year is simply to win! Quality over quantity. SP Kennel is a “dog first” Kennel. After a racing career – whether it be long or short – their dogs retire and are placed in carefully screened and selected homes. With cutting back on racing this season, this obviously means that Aliy and Allen need fewer dogs as well and their SP racing dog population can reduce. This summer and fall they actively rehomed dogs that might not have retired at this age in years’ past. But same as in the past, they weren’t in a rush to move any of their dogs because Aliy and Allen needed to find the ideal spot for his or her future forever home. SP Kennel now has dogs all over the world and part of many varied lifestyles. Check out SP Kennel’s website. Aliy’s and Allen’s harness of choice has been our Distance Harness for many years now. Jason and Melissa Stewart own and operate Owl Creek Kennel in Knik, AK. Owl Creek Kennel’s origins go back to the mid-80’s and was started by Melissa’s parents Mike and Patricia Owens in Nome, AK. Jason’s and Melissa’s goals for this season are not as ambitious as they were in the past since they welcomed their daughter (a future junior musher) to their family a year ago. Jason and Melissa, both Iditarod finishers, will take a break from this 1000 mile long race this year. However, they will enter their team in several mid-distance races throughout Alaska. Here at Howling Dog, we have a special “soft spot” for Melissa and Jason, as the lineage of the majority of their dogs goes back to dogs bred in our Howling Dog Kennel. Connect with Melissa and Jason through their Owl Creek Kennel Facebook page. The harness of choice for Melissa’s and Jason’s dogs is our Tough Skin Harness ULTRA. Amanda lives in northern Minnesota, just south of the northwest Ontario border. She is the owner and operator of Snomad Racing. Besides competing in races such as the 400 mile John Beargrease Marathon, Snomad Racing also travels for exhibitions and speaking engagements; works on TV, film, and modeling projects, and puts winter and mushing products to extreme tests for sponsors committed to making the toughest gear and equipment on the market. When Amanda is not training and racing, she is found volunteering for the Kabetogama Fire and EMS departments, raising pups, exploring woods and waters, and laughing with good friends. Amanda is excited about a group of young dogs she will be working with this winter. If you would like to meet Amanda’s dogs or to learn more about the training of canine athletes, visit Snomad Racing Facebook Page. Amanda’s harness of choice is our Distance Harness and our Tough Skin Harness. Dagenais Kennel is a premier limited class sprint racing kennel located in Quebec, Canada, specializing in 6-dog and 8-dog class. Kati’s team won almost every race they entered from the beginning of her racing career (since 2008). Kati & Martin traveled to Alaska where she won the Limited North American Championship in 6-dog class, where her team broke the track record on relatively slow trail conditions. Kati also won the IFSS World Championship in North Pole, Alaska in 2013 in the 8-dog class. In 2015 Kati & Martin and their team traveled to Germany to compete in yet another IFSS World Championship. They returned home with a bronze medal! And last, but not least, in a very tough European Championship in Italy last season Kati had the fastest time in the 6-dog class on the last day of the race. Besides racing the Québec sprint circuit, Kati & Martin plan to fly to Europe yet again to meet their biggest competition in the 2019 IFSS World Championship in France. We look forward to having Team Dagenais represent Howling Dog Alaska at the highest level! Visit Dagenais Racingsleddogs Facebook page. The harness of choice for Team Dagenais is our Light Weight Harness. After sitting the last season out due to the arrival of her son Esteban, Julie is back! Julie is an accomplished sprint 6-dog class racer. Julie is very good with her dogs and works with them a lot on obedience. She spends as much time to work them in individual training as she spends on training them as a team. It is really important for Julie to have dogs that are happy in their everyday “normal” dog life, but also in their working dog life. Such an approach shows positive results, as Julie’s team became the World Champions in 2015 in the 6-dog class. Julie also holds multiple French Champion titles (since 2012). Julie owns a small kennel of about ten dogs. All of Julie’s dogs were born in her kennel and are the result of a very specific breeding selection. The plan for this season is for Julie and her team to do as well as possible in the 2019 IFSS World Championship in France. It will be a true challenge after a winter off and a pregnancy, but Julie belives that with the help of her future husband Sebastien she can do it! Check out Julie’s Facebook page. Julie has been supplementing our Staminex to her canine athletes for many years now. Andrey and Alla are a NEW ADDITION to our Team Howling Dog. Welcome, guys! They live in Moscow, Russia and specialize in racing in the four-dog class (both dryland and on snow). Andrey and Alla are both accomplished mushers. Their kennel’s name is Crazy Sled Dog Team. Their team has many victories under the belt, including being the Russian Champion twice. Andrey and Alla often travel to race abroad in Baltic countries, Finland and central Europe. Their biggest goal for this season it to travel to France to compete in the 2019 IFSS World Championship. Welcome aboard, Andrey & Alla! Andrey and Alla use our Tough Skin Harnesses and also our DuraCoats. Once again Rich has teamed up with us for yet another racing season! It is imporant for us here at Howling Dog to be also represented in an individual sled dog sport. Rich has been with us pretty much from the start of his racing career. We have provided Rich with technical support and offered quality and functional gear. Howling Dog Alaska also supports Windy City Mushers Club – a group of mushing enthusiasts Rich founded a few years back in the Chicago area. Rich is in for another exciting season – whether dryland or on snow. Same as Martin & Kati, Andrey & Alla and Julie, Rich is also planning on competing in the 2019 IFSS World Championship in France. Visit Windy City Mushers Facebook page. Rich has been using our Skijoring Belt PRO and our Standard Harnesses. Here is a training tip from Rich Kisseloff, a competitive bikejorer and skijorer and a member of Team Howling Dog. Those of you who are just getting into the sport, will find this helpful. Abigail, that’s a great question and one that I went through with my very first dogs. The fact that they have been trained to heel probably does play into their not wanting to pull. Now you have to counter that with conditioning the dog to now pull when they have a harness on. When I first started out, I found the best way to train the dogs was to hook up a tire or something heavy to pull. I’m assuming your dog is about a year old now or close to it, so short training sessions should be ok. I started out with a small car tire, that was too heavy, then I moved down to a motorcycle tire which worked out great. I started out by hooking my dog(s) up and running out in front and calling him/them to me. Once he/they graduated to that I then walked/ran out in front while they tried to keep up with me. Once I felt confident they could do it I slowly weaned myself off the front and slowly drifted back to where I could give them commands from behind. Sometimes I had my then girlfriend run out in front or ride a bike slowly ahead of us. Mind you I did most of this in apartment complex parking lot that I was living at. I eventually went out to jogging trails and eventually took it off road. It’s very important if you can have someone being a “rabbit” out in front. With luck and proper training, hopefully, they will soon “get it” and eventually pull without needing the “rabbit”. In one and two dog sports as with sled and other disciplines, the idea is not for them to totally always be pulling dead weight. There is a fine line between helping them to the point that they don’t get lazy and not want to pull. You can help them too much that all they are doing is running. You always want them to have some sort of tension or friction when in training so that in a race, should you decide to ever race, that way they will always pull when it gets hard. Many big sled teams use ATVs in early season training to build muscle by actually having the dogs pull and they run a lower gear so it’s a little harder on them. This is getting a little more advanced, so I’ll keep it at that for now. Training in different types of terrain and distances always helps so they don’t get bored. Keep the training changing. The biggest thing with people just starting out is to also remember that you don’t have to go out for miles and miles. Most house dogs and pets just do this recreationally so just doing a couple hundred yards to a couple miles once they are doing it on their own is all they need to do. When not training or walking on a leash you could also be teaching them commands like gee and haw. Parking lots full of cars and sidewalks work great for that. Remember to always think of the dog’s safety first, so remember to train only during cool temperatures and keep them hydrated and always have water and a bowl handy. Lastly, keep it fun. Don’t run or train a dog into the ground, or to exhaustion every training session. You need to leave a little bit in the tank. You want to make it fun for them. You want them to look forward to their next training session. Don’t forget this is like any other training too, so if they are food motivated then use treats. Shop Howling Dog Alaska Skijoring Gear! Announcing the winners of our 2018 Photo Contest! Image submitted by Ed Boon (United States). The photo features, Aska, an avid hiker, who is always comfortable in our Distance Harness. Image submitted by Michelle Miller (United States). Michelle’s pack of Siberian Huskies is talking a walk in our Distance and our Second Skin Harnesses. Image submitted by Julie Schultz (United States). Julie’s well-trained gang is posing for a photo sporting our Standard and Distance Harnesses. Image submitted by Tiago Costa (United Kingdom). Tiago’s dogs are exploring the countryside while wearing our Tough Skin Harness and our Hybrid Light Weight Harness. View complete vote tallies here. We understand that shopping online can be tricky and that on occasion a harness must be tried on first in order to select the correct size. Or perhaps the dog is “oddly shaped” and a harness needs to be exchanged for a different size. Or perhaps the customer makes a mistake and orders the wrong size of a harness. It happens! We are a relatively small company and we can’t afford to subsidize shipping costs. All exchanges are shipped by Priority Mail (insured). Unlike some “big name” companies out there, we keep our products prices low and affordable. We do not mark up our equipment by hundreds of percent to justify free exchanges/free return shipping. This keeps the prices of our gear affordable for everybody! We try to be flexible and work with you, the customer, to select the best fitting harness style/size. We have used Howling Dog harnesses for over 10 years. After switching to the Distance Harness system, we have never looked back! We sincerely believe that our long distance mushing set up using system “Howling Dog Distance harnesses and no necklines” is overall safer and healthier for our team. This results in our dogs becoming injured less, tired less and can compete at a higher caliber. Our Huskies have no leash attached to their necks urging them to continue down the race trail, they have free will, and choose to continue down the trail in order to please their musher and please them self. We believe that our successful racing results over the past five years (Two Rivers 100/200 wins, Copper Basin 300 wins, Yukon Quest wins, Iditarod top placings) are indicative of healthier and happier dogs. That is what the sport of dog mushing should be about. Howling Dog Alaska Distance Harness – used and recommended by Aliy Zirkle and Allen Moore! Howling Dog Alaska has been one of Jeff’s main sponsors for many years now. And we are mighty proud of it! And here we are, with yet another season ahead of us! Jeff King has captured worldwide media attention for decades. Associated Press, BBC, CBC, ABC’s “Wide World of Sports,” ESPN, CNN, Discovery Channel, National Public Radio and Mushing Magazine have regularly featured Jeff in race coverage of the Iditarod and international news reports. From his scientific methods of feeding and training dogs, to his calculating trail strategies and innovative sled designs, Jeff has been the one to watch, year after year. Jeff moved to Alaska in 1975 in search of adventure. He quickly became interested in dog sledding and Alaskan huskies, devoting all his spare time and money to building his own team, while developing a construction business. He began racing in 1980. His competitive nature and athleticism had found a new outlet, and Jeff set his sights ever higher, entering his first Iditarod just one year later. In 1992 he decided to devote his full time and energy to training and racing, setting aside his construction business. He won his first Iditarod the following season. Jeff enjoys living just outside of Alaska’s Denali National Park and sharing his life with his sled dogs. In the summer months, Husky Homestead welcomes visitors from around the world to watch his sled dogs in action, hear stories of adventure, learn about Alaskan Huskies, the tradition of dog mushing and the life and spirit of Alaska, the last frontier. A natural-born storyteller, Jeff shares a lifetime of adventure stories in public speaking engagements and in his book Cold Hands Warm Heart. Since the release of his first collection of stories, fans have been begging for “More!” In the fall of 2011, Jeff produced a newly expanded edition with additional stories and photographs and a deeper look into a life well-lived. Jeff’s harness of choice is our Hybrid Light Weight Harness. Here they are! The famous wife & husband duo, known not only for their outstanding race performance but also for dog care that is second to none! Aliy Zirkle and Allen Moore own and operate SP Kennel – a premier Alaskan Husky sled dog kennel in Two Rivers, Alaska. They are dedicated to their individual dogs through excellent health, nutrition, training, and care. Aliy races the Red Team and Allen races the Black Team. The goals and strategies for each team vary from race to race so any dogs may run on either team at any time. They strive to be the best they can through complete dedication to their canine teammates and to the sport. They are also committed to the Alaskan community that has given them unwavering support and incredible encouragement through the years. SP Kennel is a “dog first” Kennel. Aliy and Allen put the care and safety of their dogs above everything else, including competition results. Their breeding program is highly selective. They breed only for the dogs they want to raise, train and race. They do not breed in order to sell dogs or lease dog teams. Their dogs are bred for their team. They keep every dog they breed for its entire competitive racing career. After a racing career – whether it be long or short – their dogs retire and are placed in carefully screened and selected homes. The dogs than live out the rest of their lives in situations and homes that are suited to their personalities and traits. Many of the dogs transition to a “couch life” easily. Active dogs who still need to run — but not the number of miles involved in our racing program — are placed with highly qualified “dog first” recreational mushers world-wide. These retired Iditarod and Yukon Quest veterans spend the rest of their lives doing what their genetics have taught them in a relaxed, enjoyable “pet home” atmosphere. Aliy and Allen are both Yukon Quest Champions. Allen has won the Copper Basin 300 six times and Aliy has placed in the top five in the Iditarod for the last five years (placing second three consecutive years: 2012, 2013 and 2014). Howling Dog is thrilled to have Aliy and Allen aboard for another season! Check out SP Kennel’s new website. The SP Kennel’s harness of choice has been our Distance Harness for many years now. Jason and Melissa Stewart own and operate Owl Creek Kennel in Knik, AK. Owl Creek Kennel’s origins go back to the mid-80’s and was started by Melissa’s parents Mike and Patricia Owens in Nome, AK. Jason’s and Melissa’s goal for this season is for Jason to compete in his first Iditarod and cross under the Burled Arch in Nome. Jason and Melissa welcomed their newest member, Ellen Patricia, to Team Stewart in August of 2017. Jason also has a son, Caswell, who is 12. Jason Stewart, 42, was born and raised in the Washington, DC area. Served Honorably in the USMC Infantry from 1993-1997. He received his Associates of Arts Degree from Hagerstown, Maryland in 2002. When he was 12, he had started spending summers in Alaska visiting his dad and his brother, Since, he got tired of feeling homesick whenever he left Alaska, he left Maryland permanently in 2004 and moved to Alaska. He got started running dogs on an overnight camping trip in 2000. In 2011 he became a handler for another musher. In 2012, Jason met his future wife, Melissa Owens, and began getting as serious about her as he was about dogs. He ran his first race in 2015 and hasn’t stopped since. Jason has worked as a Corrections Officer for the past three years. He is also an Advanced Glock Armorer. He enjoys building dogsleds in the offseason and helping his wife with her business ventures. Amanda is originally from Bay City, Michigan, and now lives in northern Minnesota, just south of the northwest Ontario border. Amanda was introduced to the sport of mushing in 2003, and after a few years of learning the basics from a recreational dog sledding club, she began building a kennel that would allow her to race professionally. Today, Amanda is the owner and operator of Snomad Racing. She was awarded Rookie of the Year, earned a 4th place finish, and passed another Iditarod qualifying race. All while competing in her first nearly 400 mile, 2013 John Beargrease Marathon. Snomad Racing also travels for exhibitions and speaking engagements, works on TV, film, and modeling projects, and puts winter and mushing products to extreme tests for sponsors committed to making the toughest gear and equipment on the market. When Amanda is not training and racing, she is found volunteering for the Kabetogama Fire and EMS departments, raising pups, exploring woods and waters, and laughing with good friends. Amanda’s harness of choice is our Distance Harness. Dagenais Kennel is a premier sprint racing kennel located in Quebec, Canada. Martin got introduced to the sport of mushing in 1986 and Kati began racing in 2008. Kati’s first year of racing in was in the 4-dog class. In 2009 she entered the IFSS World Championship in the 6-dog class. Kati’s team won almost every race they entered from the beginning of her racing career. Kati & Martin traveled to Alaska where she won the Limited North American Championship in 6-dog class (her team broke the track record on relatively slow trail conditions). Kati also won the IFSS World Championship in North Pole, Alaska in 2013 in the 8-dog class. In 2015 Kati & Martin and their team traveled to Germany to compete in yet another IFSS World Championship. They returned home with a bronze medal! This racing season Kati & Martin plan to race the Québec sprint circuit and maybe some Mid-West races in the 6-dog class. Their challenge for this year will be the European Championship in Italy in January. Team Dagenais looks strong, as there were a few young dogs added (dogs Kati and Martin raised). All the youngsters look very promising! It should be an interesting season for all, the humans and the dogs alike! Good luck guys! Make Howling Dog proud! Julie is NEW to Team Howling Dog! We have known Julie since she was a young girl and we are happy to have her aboard! Julie is an accomplished sprint 6-dog class racer. In 1977 Julie’s parents Miriam and Thierry Bloch, started mushing with Greenland dogs, some Siberians, and later, with Alaskans huskies from Terry Martin (Idaho), and Jim Welch. Since the beginning, they have been involved in the sport as a family, so when Julie was old enough, her older sister took the main team and began to carry the family flag in the world of mushing. The kennel’s roots are built on Jan and Lollo Swenson’s and Taina Teras’s bloodlines. Both kennels are located in Sweden and Julie’s sister Karine spent a winter there in 1999. Julie took her sister Karine’s place in 2002. Even now, the team still consists of Jan’s, Lollo’s and Taina’s bloodlines. There were also some Ellis/Lundberg dogs added to the mix. Julie works with the dogs on a lot of obedience. She spends as much time to work them in individual training as she spends on the time passing on a team. It is really important for Julie to have dogs that are happy in their everyday “normal” dog life, but also in their working dog life. Such approach shows positive results, as Julie’s team became the World Champions in 2015 in the 6-dog class. Julie also holds multiple French Champion titles (since 2012). The kennel is now built with 10 dogs including 2 retired ones. Only 6/7 dogs are trained to be part of the main racing team. All of Julie’s dogs were born in her kennel and the result of a very specific breeding selection. Julie is very grateful to her sister Karine and her boyfriend Sebastien for all their help and support. Once again Rich has teamed up with us for yet another racing season! We have supported grassroots Windy City Mushers Club and Rich from the start of his racing career. We have provided Rich with technical support and offered quality and functional gear to him and his grassroots club members. Rich introduced his new Greyster pup Guinness to the mix last season and he took on the role as Riche’s main dog. Guinness quickly surprised and impressed Rich at such a young age. He showed great poise and a fearless attitude! The 2016-17 season saw Rich finish no worse than 2nd place, not counting the World Championships where he was unable to use Guiness due to age restrictions. In every other race they only finished 2nd a couple times against teams using two dogs. There were many highlights last season. The most meaningful was winning the Skijor One and Two Dog National Championships. Rich and his dogs were the top team at the Canadian National Championships in the 1 dog scooter, 2 dog scooter and bikejor. Rich did do canicross too but only for fun. The other highlight and signs of things to come were finishing in a top select group in the relay Skijor leg at the World Championships. The 2018 season will be an exciting one. Rich is planning on attending races in Europe and possibly Quebec or Colorado. We look forward having Rich represent Howling Dog Alaska at the highest level! Within the last couple of years, Rich has introduced many new people to the sport of mushing through Windy City Mushers. The harness of choice for Rich’s canine athletes is our Second Skin Harness. Announcing the winners of Howling Dog Alaska’s 2017 Photo Contest! Image submitted by Lauren White from Scotland. The photo is of Lauren and her beautiful girl Arya on Lauren’s wedding day doing what they love the most – running together. 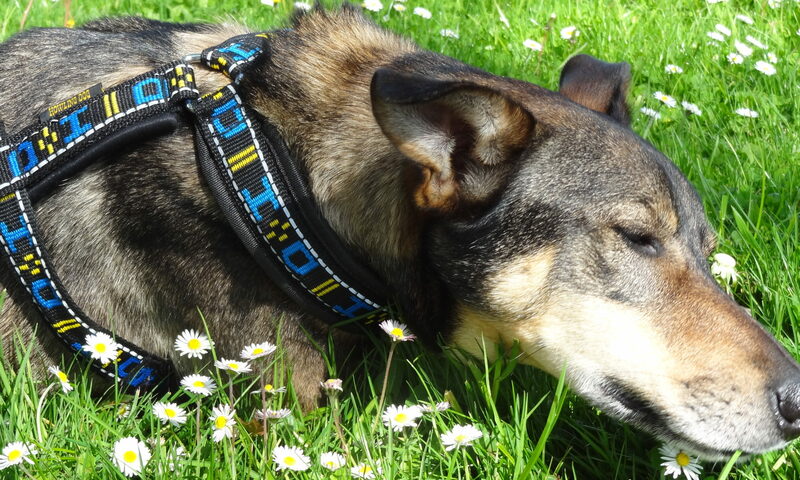 Arya is wearing our super-comfortable Second Skin Harness. Image submitted by Suzanne Flagg from New Hampshire. The dog in the photo is a Chinook – an American breed. Chinooks were originally bred by Arthur Walden as heavy-haul, long distance sled dogs. Pictured is our best-selling, multi-purpose Distance Harness. Image submitted by Meredith Michener from Pennsylvania. Kona, the Greyster, loves scootering in her Tough Skin Harness. Pictured are Brodi (image submitted by his “dad” Hunter Rosner from California ) and Aska (image submitted by his “dad” Ed Boon from Georgia). Both dogs are rocking their Howling Dog Alaska Distance Harnesses! Our customers often ask us what the difference between the DuraCoat and the ThermoCoat is. Here is a simple explanation. Medium weight, simple dog coat. Great value for the money for someone on a tighter budget. The outer shell is durable. The neck opening is a fixed fit. The measurement of the neck circumference is crucial while selecting the correct size. The coat might be difficult to fit dogs with thick necks. DuraCoat does not provide full belly coverage. Layering with one of our Chest Protectors is recommended if needed. The neck opening is adjustable. The coat will fit a majority of the breeds out there. ThemoCoat provides full belly coverage. IMPORTANT NOTICE: While shopping, select your size carefully. Not sure about the size? Go by the weight of your dog. Our coats are non-returnable, non-exchangeable. We are here to help you choose the correct size if needed. If in doubt, please contact us. You can contact us via email at ivana@howlingdogalaska.com. We are proud to have Jeff King, THE KING, aboard for yet another racing season! Howling Dog Alaska has been one of Jeff’s main sponsors for many years now. Jeff, a four time Iditarod Sled Dog Race Champion and a world class musher, is known for his creativity and willingness to experiment. He has started many trends in mushing – beginning with the use of short harnesses and running without necklines to redesigning the long distance dog sled and much more. Howling Dog is very proud of the long relationship we have had with Jeff. Follow and cheer for Jeff during the 2017 Iditarod Sled Dog race! Visit his kennel located just outside of Denali National Park in the summer. Here they are! The famous wife & husband duo, the owners of SP Kennel in Two Rivers, Alaska, dedicated to the individual dog through excellent health, nutrition, training and care. Aliy races the Red Team and Allen races the Black Team. The goals and strategies for each team vary from race to race, so their dogs may run on either team at any time. Every winter Aliy and Allen compete in many mid and long distance events but their focus is one: The Copper Basin 300, the Yukon Quest International Sled Dog Race and the Iditarod Sled Dog Race. Aliy and Allen are both Yukon Quest Champions. Allen has won the Copper Basin 300 six times and Aliy has placed in the top five in the Iditarod for the last five years (placing second three consecutive years: 2012, 2013 and 2014). Howling Dog is thrilled to have Aliy and Allen aboard for another season, as they both strive to be good-will ambassadors for the sport of sled dog racing, balancing winning performance with exceptional sportsmanship, community outreach and advocacy for the amazing Alaska husky. Follow Aliy & Allen on their blog, The SP Kennel Dog Log. Melissa and Jason, the owners of the Owl Creek Kennel in Knik, Alaska, are both really excited for the upcoming season. Melissa is signed up for the Quest 300, and she is also planning on competing in the 2017 Iditarod Sled Dog Race. Jason will be running the Knik 200, Copper Basin 300 and most likely the Willow 300. They are also looking at having teams in a couple other races, so it will be a busy race season for them. Here at Howling Dog we have a special “soft spot” for Melissa and Jason, as the lineage of the majority of their dogs goes back to dogs bred in our Howling Dog Kennel. Connect with Melissa through her Facebook page. Amanda was introduced to the sport of mushing in 2003, and after a few years of learning the basics from a recreational dog sledding club, she began building a kennel that would allow her to race professionally. Today, Amanda is the owner and operator of Snomad Racing. She was awarded Rookie of the Year, earned a 4th place finish, and passed an Iditarod qualifying race. All while competing in her first nearly 400 mile, 2013 John Beargrease Marathon. Starting this year, Snomad racing will be offering sled dog rides during their fall training season in the comforts of a fully enclosed and heated 5 seat side by side! Amanda also travels for exhibitions and speaking engagements, works on TV, film, and modeling projects, and puts winter and mushing products to extreme tests for sponsors committed to making the toughest gear and equipment on the market. When Amanda is not training and racing, she is found volunteering for the Kabetogama Fire Department, raising pups, exploring woods and waters, and laughing with good friends. If you would like to meet Amanda’s dogs or to learn more about the training of canine athletes, visit Snomad Racing website. Dagenais Kennel is a premier sprint racing kennel. Martin got introduced to the sport of mushing in 1986 and Kati began racing in 2008. Kati’s first year of racing in was in the 4 dog class. In 2009 she entered the IFSS World Championship in the 6 dog class. Kati’s team won almost every race they entered from the beginning of her racing career. Kati & Martin traveled to Alaska where she won the Limited North American Championship in 6 dog class (her team broke the track record on relatively slow trail conditions). Kati also won the IFSS World Championship in North Pole, Alaska in 2013 in the 8 dog class. In 2015 Kati & Martin and their team traveled to Germany to compete in yet another IFSS World Championship. They returned home with a bronze medal! This season the plan is to race at the 2017 IFSS World Championship in the 8 and 6 dog class at Haliburton, Ontario. Good luck guys! Make Howling Dog proud! Rich is a seasoned athlete and has many victories under his belt. These include: Dryland Scooter 2 dog Class – North America 1st place, Dryland Bikejoring Men – North America 1st place, Skijoring Men 2 dog – North America 1st place and Dryland Scooter 2 dog class – World 1st place. Rich traveled to Europe to race on a couple of occasions (Germany & Norway). He will represent the US again this winter in skijor classes during the 2017 IFSS World Championship in Bristol, Canada. Rich has a new addition to his team – a greyster Guinness, whom he imported from Norway. Rich is planning on having a busy and big year for 2017 and he is looking forward to possibly representing the US again at the 2017 Dryland World Championship in Poland. Within the last couple of years Rich has introduced many new people to the sport of mushing through Windy City Mushers. We are happy to welcome the newest member of Team Howling Dog! Ali is the co-founder of Cani-Sports Edinburgh, Scotland’s first canicross club. She has developed the club and chaired it to where it is today, standing down as chair this year to focus on her own quests. She has directed a number of sell out canicross races and competed in canicross throughout Scotland for the past few years always securing a podium place with her rescue German Shorthair Pointer Zac. However, short canicross races are not her forte, she prefers hitting the trails, training for ultra-marathons with her Vizsla; Jasper who can easily run 40 miles with her – the perfect trail dog. Jasper and Zac are Ali’s Hairy Kidz and are her world. During the 2016/2017 season Ali is looking forwards to competing in the Cani-Sports Edinburgh canicross race at Foxlake, a race she set up and directed for the last few years, a course she designed and loves. She is excited to experience the race from the other side. She is also looking forward to a number of Cani-Sports Scotland and Cani-Fit races. The canicross scene in Scotland is buzzing. Ali herself has a 38 mile hill race coming up – sadly this is dog-less. Ali is looking forwards to showcasing our Howling Dog Alaska equipment in the canicross and trail running communities on the other side of the pond. Welcome aboard, Ali! Follow Zac’s and Jasper’s adventures on their Hairy Kidz Adventures Facebook page. Ali’s harness of choice is our Second Skin Harness.